I was on the fence when my mother asked me to be her travel buddy to Hanoi. I really didn’t know that much about Vietnam, so I thought it would happen sometime maybe in the next year or two. Then my travel plans for mid-2014 fell through (that’s twice now that my plans to visit a certain country’s failed, I’m beginning to think I’m jinxed) and I just refused to let the year end without a trip. I loved that you can walk almost everywhere in Hanoi. Since we were staying at the Old Quarter, most of the places to see and shop at were within a maximum of 30 mins of walking away. I already worry about skeevy cab drivers at home, even more so when I’m abroad, so anytime I can walk to my destination, I’m happy. The only time we took a cab to was the area where the Fine Arts Museum and the complex that housed the Ho Chi Minh Museum, Mausoleum, former house, and Presidential Palace was. And the buildings are so pretty. Most of them are only a room wide, but extend backwards. The streets remind me of bookshelves. The Opera House in the French Quarter. This trip made me realise that I take terrible photos of cityscapes so I spent the better part of my first afternoon back in Manila being a human Instagram-like filter machine. Hahaha! My favourite meal in Hanoi and I have no idea what it’s called. Despite arguing over almost everything during this trip, Mama and I agreed on two things: No tour guides, and if the restaurant’s full of tourists, don’t eat there. This bilao of food was from an eatery hidden in a small alley across our hotel. No menus and nobody spoke English. Mama was actually trying to order something else from her list of food-to-try-in-Vietnam, but the waitress just looked at us like we were crazy and brought this out. SO GOOD THO’. The consistency of fishcake, but made of pork. Plus the usual basil and rice noodle cake things. Obligatory photo of my face. 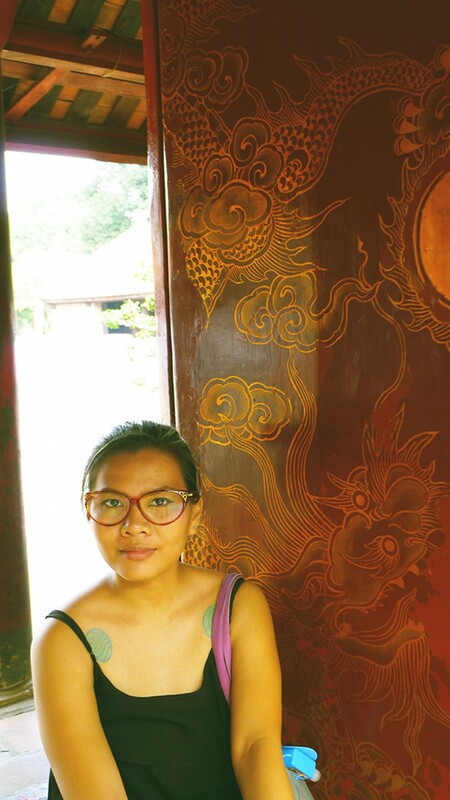 At the Temple of Literature. These are some of my favourite photos, the rest are on Facebook, if you’re interested. For now I’m making our stockpile of instant pho last as long as possible.